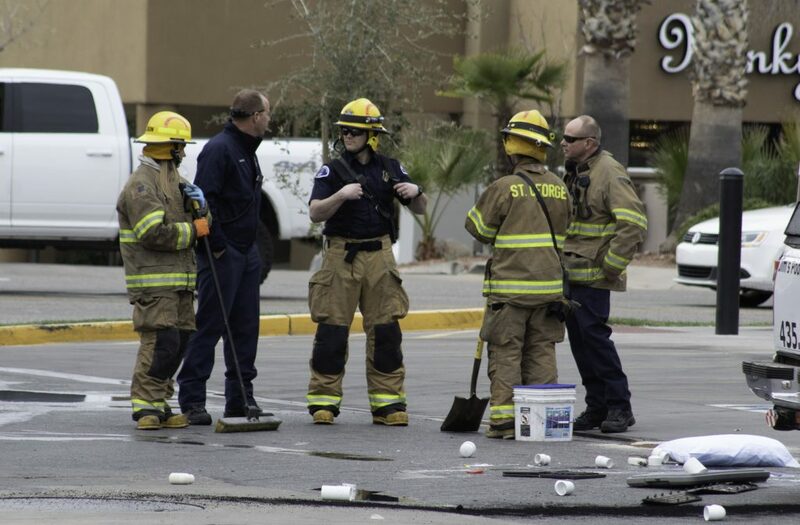 ST. GEORGE — Smoke and flying pool supplies created a “chaotic scene” Tuesday after a truck drove through two parking lots and into River Road, crashing into three vehicles as it went, according to police. 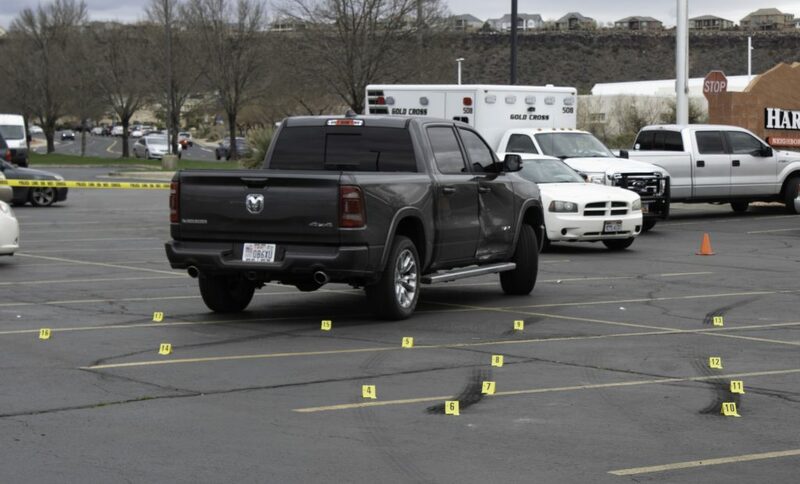 The 74-year-old driver of a white Chevrolet Silverado is believed to have been experiencing a medical issue when he sped into the Harmons parking lot around 11 a.m. on 690 S. River Road, St. George Police Sgt. Spencer Holmes said. As he drove through the parking lot, he crashed into gray Dodge Ram, leaving a large dent in its side and skid marks on the pavement. The Silverado continued on, driving through the Harmons landscape and over the curb into the middle of River Road. 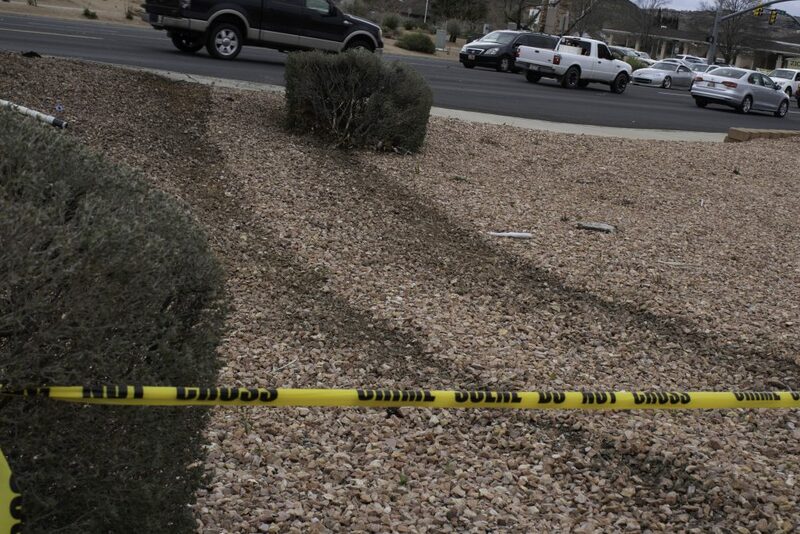 The driver took a wide right turn and made his way back towards the parking lot. It jumped over a landscape barrier and into the Maverik parking lot next door. 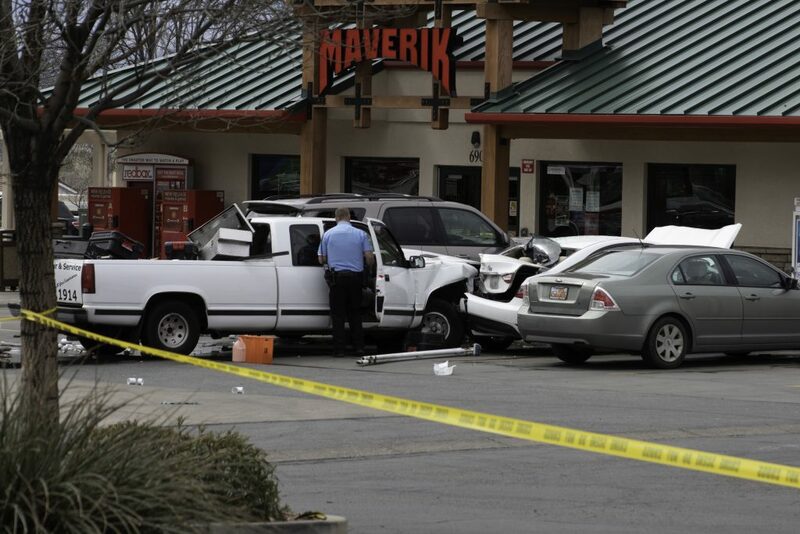 The truck managed to avoid hitting any vehicles on River Road, and missed the Maverik gas pumps, but crashed into a white Hyundai Sonata and a bronze Toyota Sequoia which were parked in front of the convenience store. 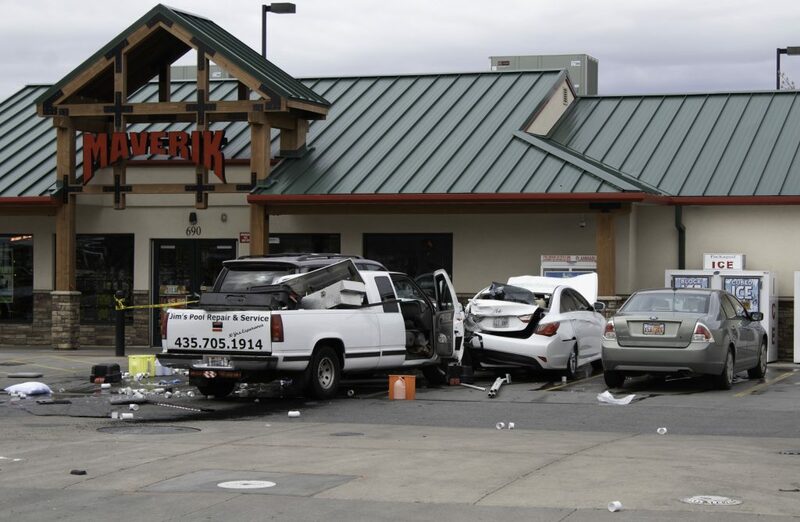 The vehicles were pushed into concrete barriers, which prevented them from crashing into the store or the propane storage tanks directly in front of them. No passengers were in the parked vehicles when the truck crashed into them. The driver’s foot was still on the gas pedal after the crash, and the spinning tires caused a great deal of smoke before a witness turned off the engine. More smoke was caused by a small engine fire in the Sonata. The St. George Fire Department responded and put out the flames. 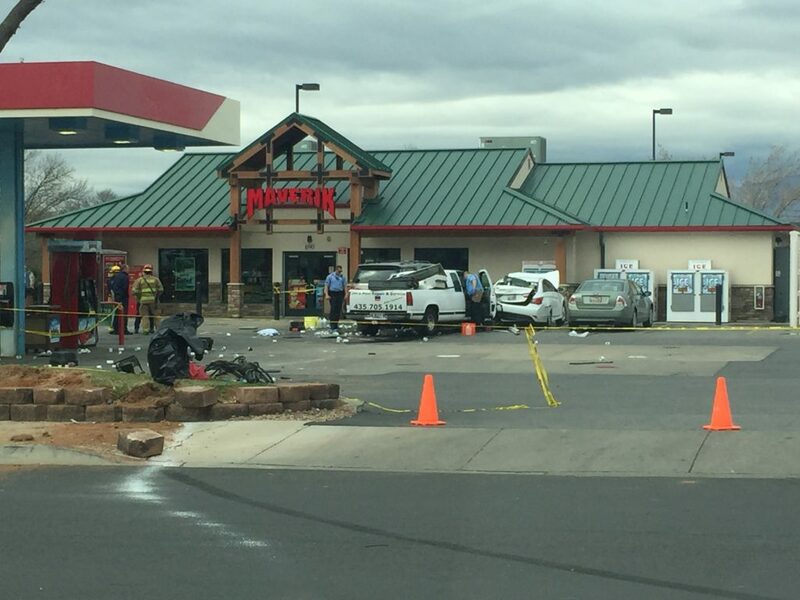 “As soon as the crash happened there was a significant amount of smoke. 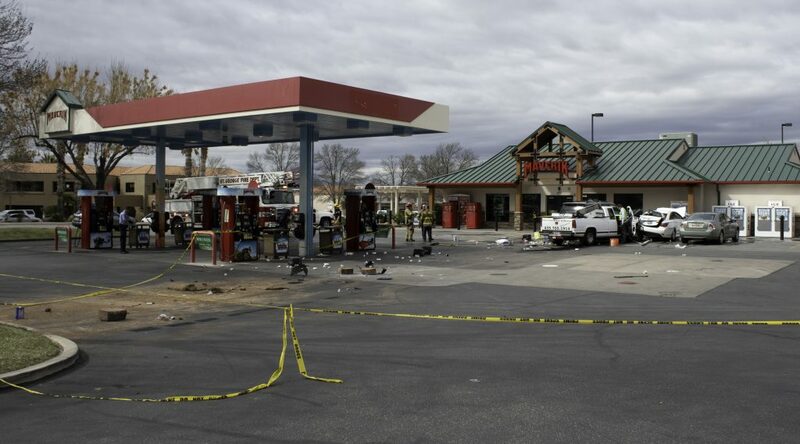 … The tire was still spinning and so the smoke from the spinning tire on the truck, and the smoke from the crash, created quite a chaotic scene,” Holmes said. 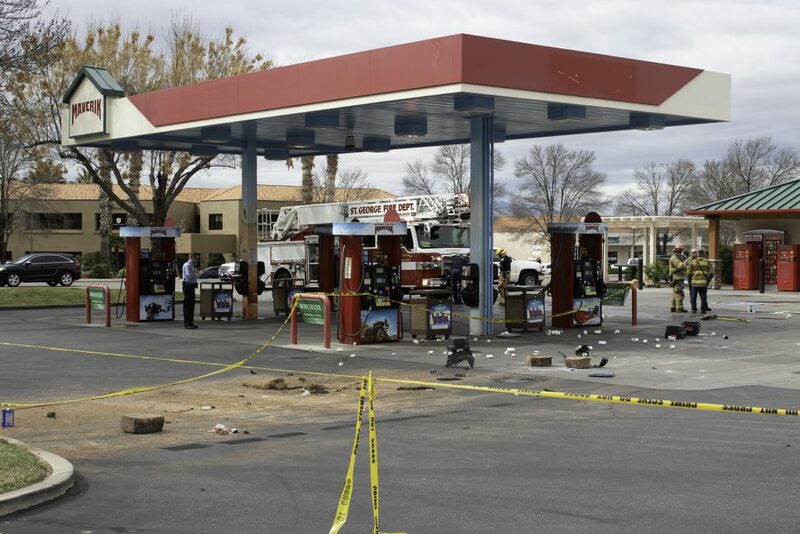 The fire department also assisted with the cleanup of chemicals as the truck was a pool and repair service vehicle, and PVC pipes, pool chemicals and tools flew out of the back of the truck during the incident, littering the parking lot with debris. A pair of witnesses were standing by their car, parked by the Sonata, when the truck crashed into the vehicles next to them. 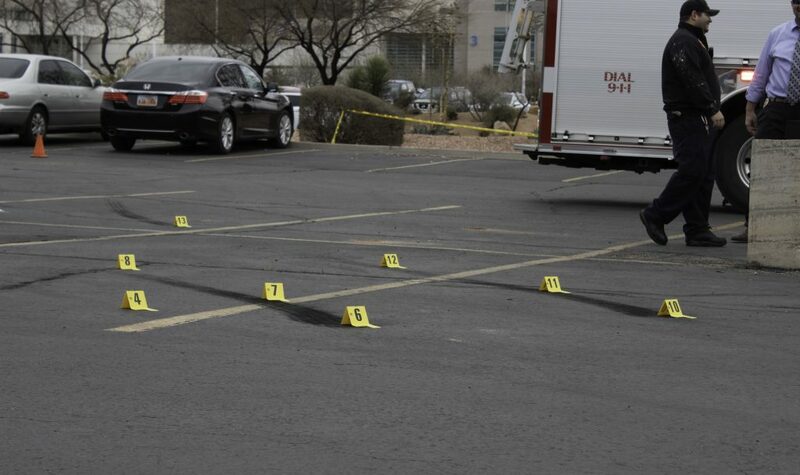 Two detectives were nearby and immediately responded to the scene. Other witnesses ran to help and administered CPR to the man, who was unconscious when police arrived. 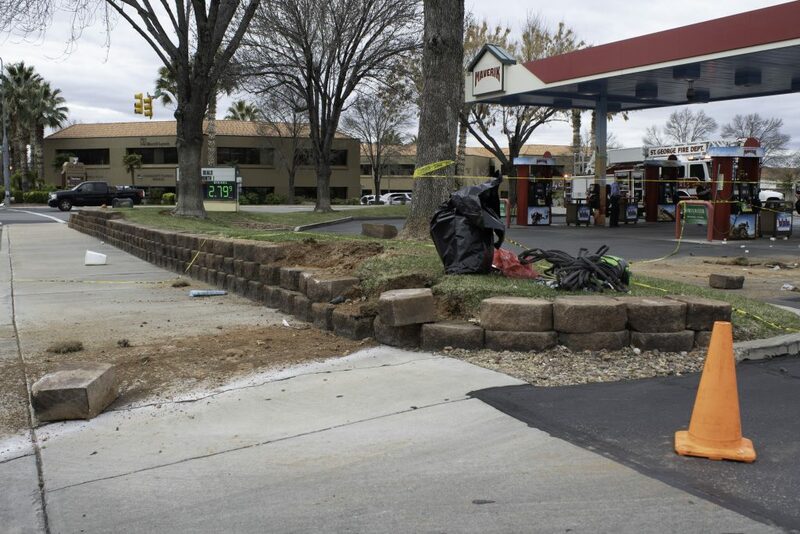 The man was extricated from the vehicle when EMTs arrived and was transported to Dixie Regional Medical Center with unknown injuries, but is currently in stable condition, Holmes said. It is unknown if the driver was wearing a seat belt at the time of the incident, and the airbags were deployed in his vehicle. The Silverado, Sonata and Sequoia were all totaled in the crash, while the Ram only had minor damages. A fifth vehicle received minor damages from the flying debris.